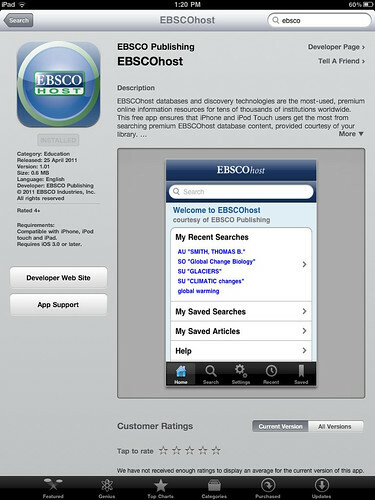 If you access EBSCOhost resources regularly, you might want to give this EBSCOhost app a try (even if you don't it's still worth giving this a spin if you own an Apple mobile device). It's compatible with iPhone, iPod Touch and iPad (though, the design/ app display size is more for the iPhone and iPod Touch than the iPad). 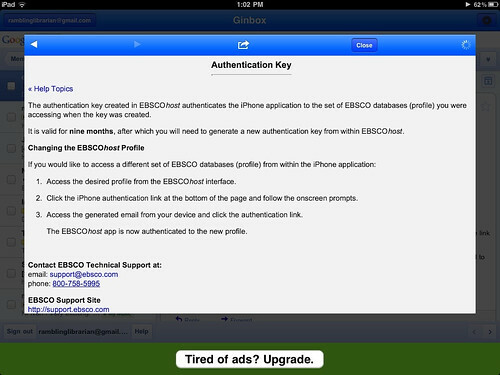 Download the app from the App Store (keyword search "ebscohost"). 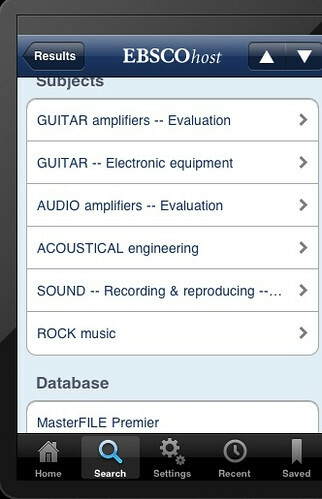 After installing the app, there's a few more preparatory steps. You need to obtain and activate the authentication key (if not, you won't see any menu options on the app). 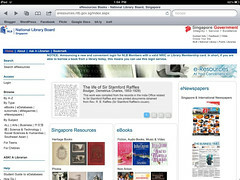 To get the key, you first login to eResources.nlb.gov.sg in order to get to an EBSOhost database (I'm assuming you've already signed up for a digital library account, or you're registered as a NLB library member. 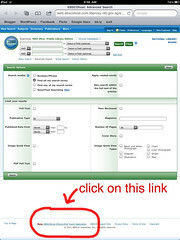 The site's How To section has details of how to sign up/ access the resources). After logging in, browse through the database listings and click on the EBSCOhost database you prefer. 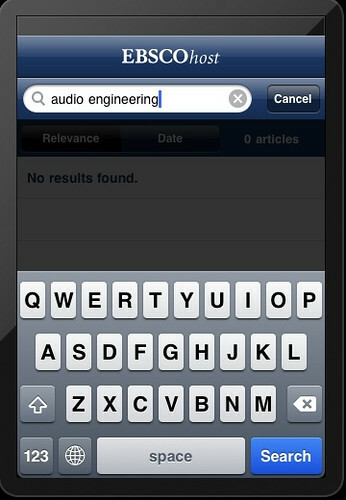 The list is in alphabetical order, so you've to scroll the page to entries starting with "E". You will be prompted to enter your email address, where the authentication link will be sent. The authentication mail looks like this. 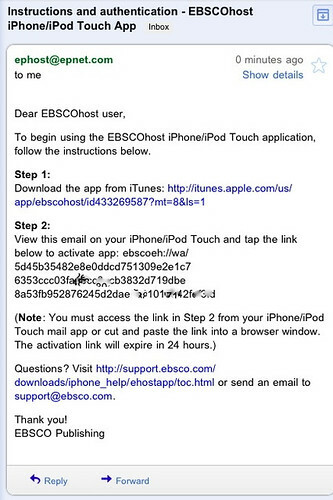 Follow the instructions (the link has to be accessed via your iPhone/ iPod Touch/ iPad). After that, you're done. 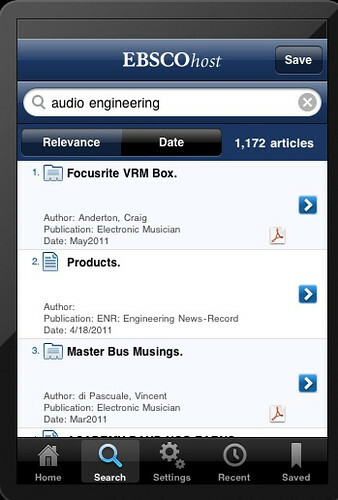 When you open the EBSCOhost app, the menu appears. Results are displayed like this. 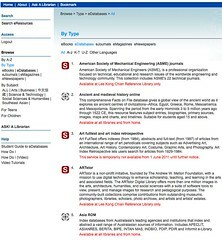 The default display is by articles that the system deems as most relevant based on the keywords. 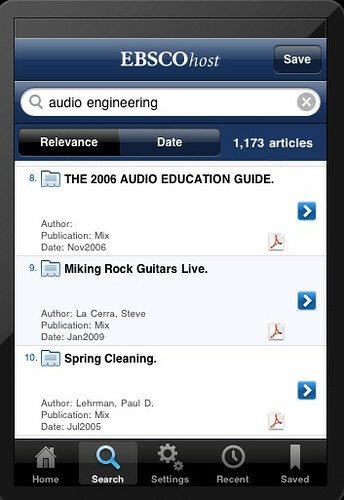 In the above screenshot, the first article was published in 2006. is You can display the most recent articles by tapping on the Date tab (the following screen now shows the first listed article published in 2011). 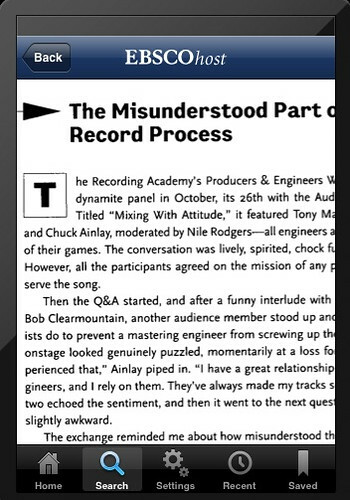 Tapping on the displayed article title brings you to a screen like this. 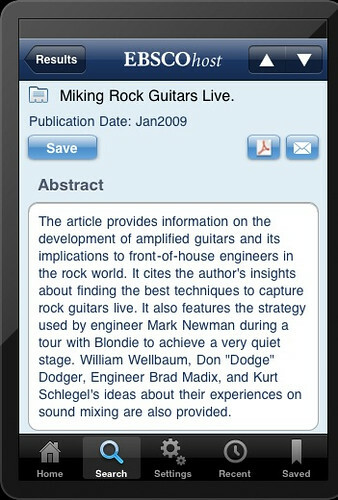 It gives you the abstract, the link to save the article to your mobile device, or download the PDF or email. 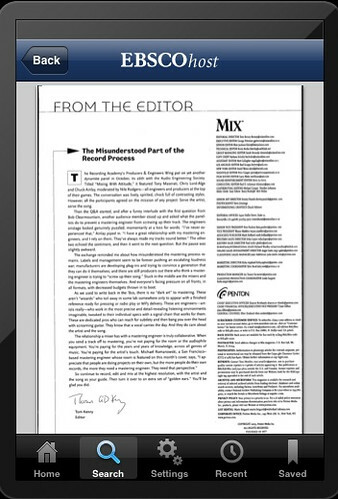 The PDF document shows the scanned article, with all other contextual information (e.g. sidebar, ads) preserved on the page. The display can be expanded by dragging. But the display window is definitely not as large as the iPad, so reading the PDF was a bit tedious (the app works on an iPad but resolution tends to become grainy when enlarged). I was able to access my saved articles from the "Saved" tab. The saved articles can be read off-line, which was great. 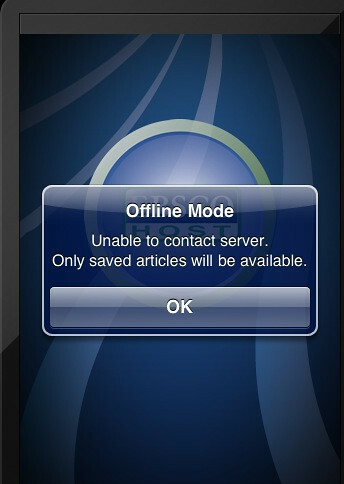 When I disconnected from my WIFI, the app says as much. 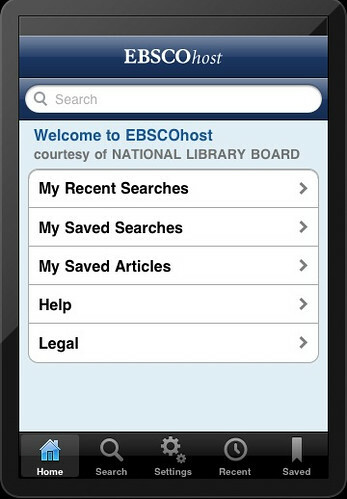 The NLB libraries subscribes to the EBSCOhost databases, which you can access at eresources.nlb.gov.sg. 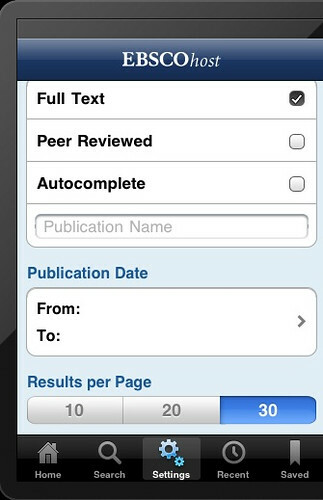 Of the 11, the ones in bold are accessible via the EBSCOhost app (at least, it's listed in the app). Hey Walter! Yeah, over kopi and teh! You're still going strong, i see. I've been doing other stuff other than blogging. Hmm, I think I've been watching too much YouTube vids on my iPad. Weapon of mass distraction, as you once wrote LOL. Thanks for the reminder. Will dig up something from my draft. thank you Ivan for all this information, I like your post specially the use of pictures to explain! Thanks very much, Ivan, for this helpful post! 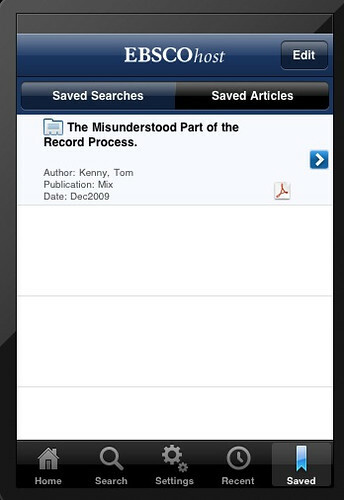 It's way better than what EBSCO has on their support site. Tools don't make change. People do.